Children with cystic fibrosis (CF) commonly fail to thrive secondary to increased energy requirements associated with chronic respiratory infection, anorexia, inadequate dietary intake, maldigestion and malabsorption . Despite significant improvements in treatment, malnutrition still remains prevalent within the CF population. Nutritional repletion and intervention involving prescription of energy-dense foods and fluids, optimisation of pancreatic enzyme replacement therapy (PERT), oral supplements and enteral feeding via gastrostomy may be required depending on preferences . Few studies have assessed the efficacy of gastrostomy feeding or re-feeding malnourished children with CF [1, 3-6] and the Cochrane Systematic review reported no randomised controlled trials . Due to the extensive geographical area that forms the State of Queensland in Australia, the Royal Children’s Hospital in Brisbane (RCH) clinic operates a model of ‘shared care’ with regional hospitals. This model enables specialist care to be provided which has been well documented to enhance outcomes for patients  while enabling patients access to local health care providers. The specialists from the CF team visit the regional centres every 6 months. Procedures such as the insertion of gastrostomy tubes, all occur at the RCH with all travelling costs reimbursed to the family. Individual insurance status is not a determinant of access to care. The aim of this study was to explore the long term effects of gastrostomy feeding on clinical, pulmonary and nutritional parameters during childhood. Secondary objectives were to benchmark our clinic practice with the recommendations documented in the Australasian Clinical Practice Guidelines for Nutrition in CF (2006)  and to evaluate the role of shared care on nutritional outcome. This case series of all fourteen children with a confirmed diagnosis of CF and who had a gastrostomy placed between January 1999 and August 2005 at the RCH, Brisbane were included in this retrospective review. As this was a retrospective case chart review, formal Ethical approval was not required. One subject had moved from another state and their pre-gastrostomy data were collected from their hospital of origin, 3 were part of ‘shared care’ arrangements so data available at regional centres was accessed in order to complete the dataset. Anthropometric and respiratory parameters, including height, weight, body mass index (BMI) and forced expiratory volume in one second (FEV1) were collated at 6 month intervals over a three year period: one year pre-gastrostomy insertion and for the two years after gastrostomy tube insertion. To allow comparison between age and gender, Z scores were calculated using CDC reference standards and the LMS method . FEV1 was not available for children under the age of 6 years and BMI was not calculated for children under the age of 2 years of age. The number of RCH hospitalisations within the 3 year period were counted and reported annually. Further information regarding mode of diagnosis, cystic fibrosis related diabetes, glucose intolerance, pancreatic insufficiency, presence of significant liver disease (as defined by the presence of portal hypertension, hepatic fibrosis or cirrhosis), chronic infection with Pseudomonas aeruginosa and other medical conditions were collected for each patient by review of medical records. Information regarding the presence of co-morbidities, commencement of oral supplements, nasogastric feeding, age and reasons for gastrostomy placement, type of gastrostomy, complications associated with gastrostomy, age and reason for ceasing gastrostomy feeding and dietary prescription (type and frequency of formula prescribed) were also documented. The effect of gastrostomy feeding upon nutritional status (height, weight, BMI) and pulmonary function (FEV1) were evaluated using the paired t-tests and over time using a repeated measure ANOVA and ANCOVA to explore the interaction with covariates such as gender and age. Data was analysed using SPSS version 14.0 and results deemed to be statistically significant when p<0.05. Data was collected of 14 patients (7 male, 7 female) with a gastrostomy tube in situ within the defined dates. The median age at the time of gastrostomy insertion was 6.63 years (0.42 – 13.0 years). All patients were pancreatic insufficient and were receiving pancreatic replacement therapy (PERT). CFTR mutations are documented in Table 1. Post (1 year) = 12 months post-gastrostomy insertion; Post (2 years) = 24 months post-gastrostomy insertion; BMI = body mass index; FEV1 = forced expiratory volume in one second (%). Of the 5 children less than 2 years of age, all were homozygous delta F508, 4/5 were infected with Pseudomonas aeruginosa, two out of five had been diagnosed with meconium ileus and all children had documented evidence of very early feeding difficulties such as problems with the introduction of solid foods. In children over the age of 2 years (n = 9), in the year prior to insertion of gastrostomy tube there were significant declines in Z scores for weight (t = 2.4, p = 0.02) and height (t = 2.7, p = 0.04) but not BMI (t = 1.6, p = 0.15). Respiratory function as defined by FEV1 (n = 7) declined but not significantly (t = 2.1, p = 0.08). The documented reasons for commencement of overnight gastrostomy feeding included failure to thrive (weight and height crossing percentiles with a downward trajectory), poor oral intake and/or failure to meet their increased nutritional requirements. Prior to gastrostomy insertion, 10 (71%) patients received oral supplementary nutrition such as fortified breast milk or formulae or oral supplements such as high energy milkshakes. The majority (86%) of patients continued to receive oral supplements after gastrostomy insertion. Eight (57%) had received enteral nutrition via the nasogastric route prior to the gastrostomy tube being placed. Enteral feeding provided included whole protein commercial products containing 1 or 1.5 kcal/ml. Pancreatic enzymes were given in an individually tailored dose titrated against the fat content of the feed to be delivered with half taken as the feed commenced and half at the end of the feeding period . The frequency of the overnight gastrostomy feeding plan ranged from five to seven times/week and aimed to provide one third to one half of estimated energy requirements. Maintenance of normal daytime intake of food and drink was encouraged. Two (14%) patients had cystic fibrosis related diabetes (CFRD) and were being treated with insulin and four (29%) patients had symptoms of significant liver disease. Of these, one had been diagnosed with CFRD and one was diagnosed with liver disease after gastrostomy feeding had commenced (see Table 1). Documented complications associated with the gastrostomy included granulation tissue at the gastrostomy site, itchiness, redness and infection, and diarrhoea and reflux associated with feeding. None of the complications were severe enough to warrant holding or cessation of overnight feeding during the 3 year audit period. Seven (50%) of children had a Nissan fundoplication at the time of gastrostomy placement. No child died during the 3 year period of interest. During the first 12 months of overnight feeding there were non-significant changes in Z score for height (t = 1.703, p = 0.112), weight (t = -0.735, p = 0.475) but a significant gain in BMI (t = -3.278, p = 0.01). FEV1 remained stable (t = 0.885, p = 0.405) (see Table 2). During the second year of feeding (12 – 24 months), nutritional gains were less evident with no significant change in anthropometric indices: Z score for height (t = -0.418, p = 0.683), weight (t = 0.619, p = 0.546) or BMI (t = 1.766, p = 0.108). FEV1 remained stable (t = 0.714, p = 0.498). Fig. (1) shows the changes in weight, height and BMI Z scores over time in children over the age of 2 years. Changs in height, weight and BMI Z scores in children > 2 years over time (mean ± SE). To examine changes over time and their relationship with age and respiratory function at the time of commencement of feeding, a repeated measures ANCOVA with age and baseline FEV1 as separate cofactors were used. This demonstrated that from the time of commencement of gastrostomy feeding to post 24 months, there were no significant change in Z score for weight, height or BMI with no interaction effect of gender or baseline FEV1. To examine if there was any differences in outcomes in those receiving shared care compared to those who only attended the specialist centre (RCH), an independent t test was performed examining differences in Z scores for weight, height, BMI and FEV1 from baseline to 12 months post insertion of gastrostomy tube: there were no significant differences in any parameter. Using paired t tests, from baseline to 12 months, FEV1 remained stable (t 0.88, p = 0.4) and this stability continued during the second year of gastrostomy use (t 0.7, p = 0.5). Using a repeated measures analysis from 1 year pre insertion to 2 years post, there was a significant decline (mean 16.7%) in FEV1 (F1,6 = 442, p<0.001), with the main decline (mean 15%) occurring in the 12 months pre- to 12 months post gastrostomy insertion (t = 3.45, p = 0.01; See Table 2). This analysis using a case series approach sought to explore the effect of our clinical practice which aims to prevent malnutrition and the spiral decline in lung function by early nutritional intervention. 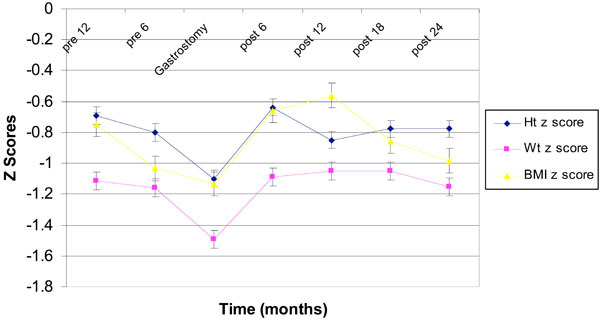 During the 12 months prior to initiation of gastrostomy feeding, weight and height decreased indicating a decline in nutritional status which acted as an impetus for insertion of a gastrostomy tube. Supplementing oral food and drink was tried in 93% of children prior to the use of overnight feeding which when instigated provided up between one third and one half of energy requirements with titration of PERT. Thus our findings support our adherence to the recently revised Australasian Clinical Practice Guidelines for Nutrition in CF . Relative to other published studies evaluating the outcomes of gastrostomy feeding [1, 4], our population had only modest levels of pulmonary compromise at the time of commencement of overnight feeding (mean FEV1 71%). Our relative success in maintaining nutritional status may be linked to the fact that less success can be expected when enteral feeding is introduced in those with greater respiratory compromise (FEV1 <40-50%) when it may be difficult to enhance energy intake to counter balance the energy and protein needs of respiration and inflammation [3, 4]. In this group of children with mild respiratory compromise (as defined by mean FEV1% 71% at baseline) it is notable that FEV1 continued to decline despite intensive nutritional support. The timing of loss of lung function is important to pin-point as our results suggests that respiratory decline could follow a period of poor nutrition and although nutrition can be stabilised by enteral feeding, respiratory function does not return to the same extent. The timing of commencing aggressive nutrition intervention needs to be further defined and suggest that more accurate measures of body composition change rather than using the blunt instruments that standard anthropometric measures offer. It has been reported that in adults with CF, lean body mass is highly correlated with lung function . Therefore determination of change in lean body mass such as by total body potassium measurement or dual energy x-ray absorbometry would help identify those where loss of lean body cell mass indicates the need for aggressive nutrition support. Earlier intervention would perhaps lessen the interactions between inflammation, infection and malnutrition. This case series demonstrate that FEV1 remained relatively stable during the 2 years after the initiation of gastrostomy feeding. However, the deficit of lung function is not recovered despite some improvements to nutritional status to the level it was 12 months prior to starting supplementary feeding. This suggests that even earlier intervention may need to be considered. Recently, additional daily growth hormone treatment alongside enteral feeding has been demonstrated to improve clinical status as well as nutritional status . Our findings do point to the need to inform patients and caregivers that huge and visually obvious gains in nutritional status should not be expected as a result of long term overnight feeding. Some evidence suggests that caregivers have a greater expectation of weight improvement than are often experienced  and, anecdotally our experience is that compliance and motivation with this additional time consuming treatment regimen tends to decline with time. More work is needed in patient reported outcomes of gastrostomy feeding and the impact it has on family functioning. It is pleasing that in a geographically diverse spread of patients, those receiving shared care have similar outcomes to those who attend only a regional centre. These results also highlight the benefit of using height and weight Z scores rather than the measure of BMI as an indicator of nutritional change. As BMI is derived from height and weight, use of BMI as an indicator of nutritional failure masks those whose general linear growth is falling away from normal expected rates. BMI should not be used on its own as a measure of nutritional status in children with CF as it can provide a misleading view of nutritional status in CF. In conclusion, gastrostomy feeding appears to be well tolerated without major complications in young children with CF whose nutritional status is declining. During the first year, the greatest gains in height and weight were seen with a levelling of these in the second year of feeding. Further research is needed to pinpoint markers that indicate when the instigation of invasive feeding methods may help to protect respiratory function, especially in younger children. We acknowledge the helpful assistance of the following people with data collection: Marie Victorsen, Student Dietitian, Queensland University of Technology; Melanie Van der Wilk, Dietitian, Royal Children’s Hospital, Melbourne; Amy Dawson, Dietitian, Townsville Hospital, Queensland; Grace Andrews, Dietitian, Hervey Bay Hospital, Queensland; Barry Dean, Joyce Cheney & Mary Jackson, Respiratory Medicine, Royal Children’s Hospital, Brisbane. Efrati O, Mei-Zahav M, Rivlin J, et al. Long term nutritional rehabilitation by gastrostomy in Israeli patients with cystic fibrosis: clinical outcome in advanced pulmonary disease J Pediatr Gastroenterol Nutr 2006; 42: 222-8. Anthony H, Paxton S, Catto-Smith A, Phelan P. Physiological and psychosocial contributors to malnutrition in children with cystic fibrosis: review Clin Nutr 1999; 18: 327-5. Oliver MR, Heine RG, Ng CH, Volders E, Olinsky A. Factors affecting clinical outcome in gastrostomy-fed children with cystic fibrosis Pediatr Pulmonol 2004; 37: 324-9. Rosenfeld M, Casey S, Pepe M, Ramsey BW. Nutritional effects of long-term gastrostomy feedings in children with cystic fibrosis J Am Diet Assoc 1999; 99: 191-4. Steinkamp G, von der, Hardt H. Improvement of nutritional status and lung function after long-term nocturnal gastrostomy feedings in cystic fibrosis J Pediatr 1994; 124: 244-9. Van Biervliet S, De Waele K, Van Winckel M, Robberecht E. Percutaneous endoscopic gastrostomy in cystic fibrosis: patient acceptance and effect of overnight tube feeding on nutritional status Acta Gastroenterol Belg 2004; 67: 241-4. Conway S, Morton AM, Wolfe S. Enteral tube feeding for cystic fibrosis Cochrane Database Syst Rev 2000; 2: CD00118-0. Mahadeva R, Webb K, Westerbeek RC, et al. Clinical outcome in relation to care in centres specialising in cystic fibrosis: cross sectional study BMJ 1998; 316: 1771-5. Waqqas Siddiqui. Dietitians Assoc of Australia National CF Interest Group Australasian clinical practice guidelines for nutrition in cystic fibrosis 2006. Cole T, Green P. Smoothing reference centile curves: the LMS method and penalized likelihood Stat Med 1992; 11: 1305-9. Stapleton D, Anthony H, Collins CE, Powell E, King SJ, Mews C. Implementing the Australian pancreatic enzyme replacement therapy guidelines for cystic fibrosis Aust J Nutr Diet 1999; 56: 91-6. Rochat T, Slosman D, Pichard C, Belli D. Body composition analysis by dual-energy X-ray absorbtiometry in adults with cystic fibrosis Chest 1994; 106: 800-5. Hardin DS, Rice J, Ahn C, et al. Growth hormone treatment enhances nutrition and growth in children with cystic fibrosis receiving enteral nutrition J Pediatr 2005; 146: 324-8. Brotherton A, Abbott J, Hurley M, Aggett PJ. Home enteral tube feeding in children following percutaneous endoscopic gastrostomy: perceptions of parents, paediatric dietitians and paediatric nurses J Hum Nutr Diet 2007; 20: 431-9.